Enter to win an autographed copy of the 30 Rock soundtrack, and download the "Werewolf Bar Mitzvah (Remix)"
This past Tuesday saw the release of the 30 Rock soundtrack, a two-disc, four season-spanning collection of all the show’s most incidental music and even more incidental songs. Did you know you can still enter to win a copy of the collector’s edition—which includes a coffee table book full of photos and script pages and stuff Tina Fey wrote down—that’s also been autographed by the cast in our Contests section? We’re still 48 hours from choosing a winner, so go do that. 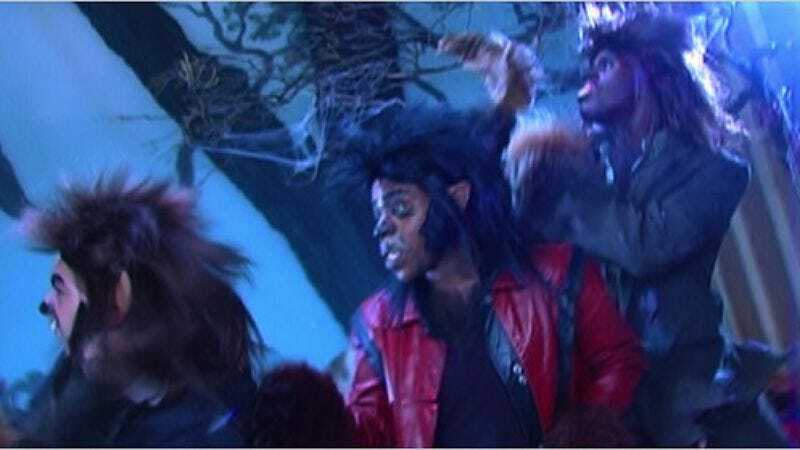 In the meantime, here’s something that’s not on the soundtrack: A revamped version of “Werewolf Bar Mitzvah” by the Remix Artist Collective, featuring Tracy Morgan and Donald Glover’s paean to boys becoming men, and forthwith becoming wolves. In addition to this and that Christopher Cross/Tina Fey duet “Lemon’s Theme” that we already gave you, you can also stream the entire album here, which is a lot of free stuff. Or you could just go ahead and buy it, in either deluxe or regular edition.